My two magic words are ZARA Kids. If you’re a normal-sized person you probably don’t understand how much I appreciate the Kinderen section in Zara 😛 My size is not even their biggest, and let me tell you, the kids’ clothes are sometimes even prettier than the adults’ ones, and most of the time cheaper too! The best thing is that if you wait until the SALE period, you can buy really cute sweaters and coats for only 10-25 EUR! And that will be an advice. From my experience the biggest sale will be in January, and if you can, wait until the second sale in the middle of January (which is right now!!!) and the prices will go even lower than the previous sale. Pull&Bear is also another favorite brand of mine because they have small-sized T-shirts and hoodies, plus their size 22 pants fit me perfectly (usually they are too long even in the smallest size). Besides the branded clothes, thrift shopping is always more fun. Leiden has quite a number of vintage and secondhand clothes shop, but it seems like they mostly have big sizes. My choice is to visit those regular flea markets, and my most favorite is the one in IJ Hallen. On my last visit I managed to buy a very cute dress, a parka and a denim jacket, which all fits me of course, for the total price of a bit more than 10 EUR! You can also find a bunch of other things there as well, especially when you’re looking for room decorations and kitchen utensils. Shops in the Netherlands offer you almost everything you need, but not everything you want. I especially find it hard to buy suitable skincare products and things that have to do with beauty; recently my eyebrow razor broke and I can’t find it anywhere here! So another option is online shopping, with Amazon UK and Ebay being my two most frequently visited sites. They always have the things that we can’t find here, and the main reason is that the shipping fee is not too expensive. 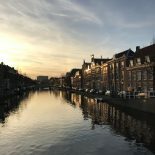 How do you do shopping in the Netherlands? Please share with us! This entry was posted on January 15, 2016 by in Living in Holland, Uncategorized.